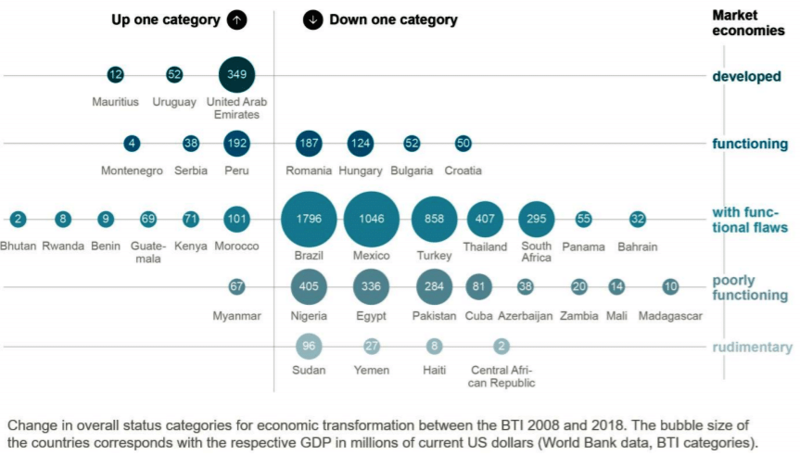 The 2018 edition of the Bertelsmann Transformation Index, in short BTI, published in March finds that the quality of democracy, market economy and governance has fallen to its lowest level on a worldwide average of 129 countries covered in the assessment since the index was started twelve years ago. 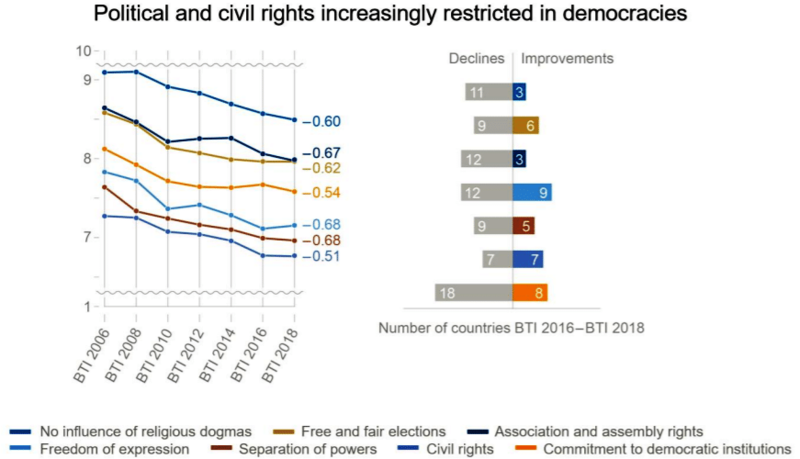 According to the study, 40 governments, including some of more advanced democracies, have curtailed the rule of law over the past two years, and 50 countries have seen restrictions on political freedoms. The authors consider “unsatisfactory socio-economic development to be one of the greatest impediments to development towards democracy and economic sustainability”. The BTI seeks to identify whether governmental policies are moving a country successfully towards democratic rule of law and a free-market economy. This is assessed through 17 objective measures, which are split among three categories. The results are divided into two categories; the Status Index and the Governance Index. The former assesses where each nation stands on “their path toward democracy under the rule of law and a social market economy”. The latter assesses the quality of the governance steering the nation on that path. Globally, government responsiveness to social unrest has declined, while political and social polarisation has increased. At the same time, political freedoms have greatly diminished as nations across the world covered in this study experienced political backsliding, including some of the most developed. Economically, a slump in global commodity prices has hit developing nations hardest, yet governments have done little to soften the hardships this has caused. While more nations remained democratic than autocratic, this still does not belie current fears of rising autocracy. 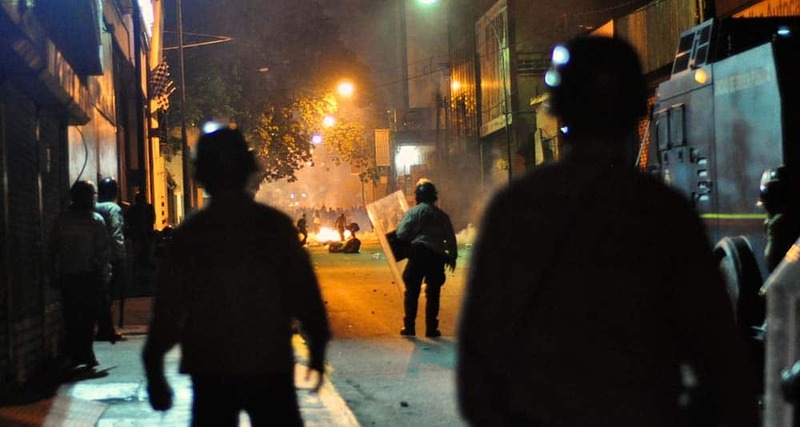 Five nations – Nicaragua, Lebanon, Bangladesh, Uganda and Mozambique – turned autocratic as democratic standards were undermined, while only two developed from autocracies into fragile democracies, Burkina Faso and Sri Lanka. In many more countries the rule of law is being eroded by increasingly autocratic politicians, as seen in Hungary, Turkey, the Philippines and Mexico. 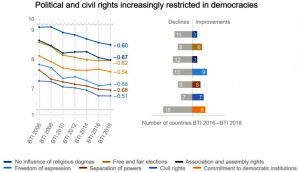 This has been a global trend, with all too many defective democracies witnessing “the rule of law and political participation opportunities [being] increasingly restricted”. This is demonstrated in the following figure which shows a weakening of political institutions in most of the countries assessed under the index. The report also noted that most countries are experiencing increasing societal polarisation, a trend manifested through “clearly noticeable” societal divisions and exacerbated by a decreased ability or willingness for governments to diffuse social tensions. Thus, the report found that of 129 countries assessed, 79 were in a state where “social divisions are clearly noticeable”. The economic transformation trend is defined by “less growth, more social inequality”. The report finds that the global average for its metric on socioeconomic development fell to an all-time low, though the decline was lower in democracies than autocracies. 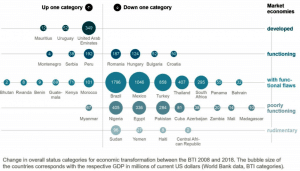 The next figure shows the trend of economic regression, in which many of the largest economies have dropped in the rankings, with their market economies declining from “developed” to “rudimentary”. The report notes that this trend is less present in nations with stable governance institutions that maintain good economic practices, due to their commitment to reinforcing “market-economic institutions over the long term”. Thus, the report finds a correlation between committed development of democratic political institutions and the quality of economic governance. The correlation between economic and political trends has shown that retention of democracy remains inherently advantageous, but that may not be enough to overturn the ongoing trend of the weakening of institutions. In the face of rising autocratic tendencies among many governments, it would be advantageous to highlight to every developing nation the strong linkages between democracy and economic strength. However, it is not just those nations at imminent risk of autocracy that should take heed of this report. The rise of political polarisation and economic inequity in almost every country should be seen as an inherent danger to global stability and democracy. Charles is a recent Graduate, with a Masters Degree in Global Politics. He worked as the UNPA Campaign's intern in New York in 2018. He is a member of Democracy Without Borders and a regular blog contributor.